You've finally returned to the surface. The slime has been mopped up. The mad priest of the troglodytes has fallen. You've looted the giant treasury. The troglos and giants won't be a problem now. The golem factory was shut down. You've dealt productively with the queen. You got past the alien beasts. You have won the Avernites a home on the surface. You hunted down three monsters for a bounty. You found one of the great artifacts of Valorim. You won Avernum 3: Ruined World on Normal difficulty. 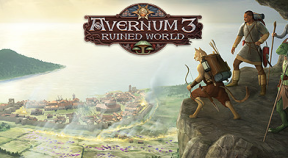 You won Avernum 3: Ruined World on Hard difficulty. You won Avernum 3: Ruined World on Torment difficulty. Get the blessings from five stone circles. Glorious gifts await! You've found 8 of the Xian items. Craft five nice magic items. Get five mage spells to level 3. Get ten mage spells to level 3. Get twenty mage spells to level 3. Get five priest spells to level 3. Get ten priest spells to level 3. Get twenty priest spells to level 3.